“I like to build things,” said Kent Black. 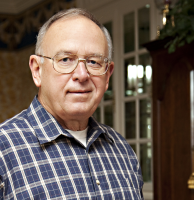 He built a log house in Tanglewood, the first home that he and his wife Karen had at Lake Texoma. On the K Bar K Ranch northwest of Pottsboro, the spot the two of them now call home, he built, or rather supervised, the building of the three-story Georgian home with the roof top cupola that offers a view of the lake. These days, as chairman of the Reba Ranch House building committee for the Texoma Health Foundation, Black is building again. The end of one of the photo shoots for this story found him climbing the steep slope north of the Ranch House site in the bitterly cold December wind to take a picture of the progress for an upcoming committee meeting. In the past, Black has built radios, top secret communication systems used by the U.S. Navy to communicate with submarines, and other types of high-end electronic wizardry. At least he helped to build and run the companies that made those things. And at the end of a long and productive career in business, he built rocket ships to take men to the stars. OK, a little poetic license there, but Black was the first CEO of the United Space Alliance, a joint venture between Rockwell International and Lockheed Martin formed in 1996 at the behest of NASA to consolidate Space Shuttle programs under one prime contractor. Not bad for a farm boy from Illinois with a yen for electronics. 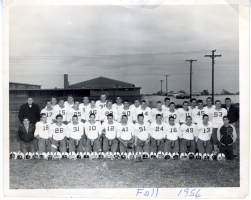 Black's winning team from 1956. Being the captain of the football team with a cheerleader for a girlfriend was the stuff dreams were made of in those days, and Kent Black succeeded on both points. He was a junior and Karen Jones was a freshman at Carrollton High when they met and started dating, and three years later, the summer between his junior and senior years at the University of Illinois, they were married. In 1972, Rockwell International, a mega conglomerate with products and operations as diverse as space craft, commercial electronics, automobile components, printing presses and more, acquired Collins Radio. For Kent Black, becoming part of a bigger company meant more and bigger opportunities. That changed when Black became a Texas resident. “We loved it immediately,” he said. “It wasn’t that much different from what we knew in Iowa.” No, Texas wasn’t barren, and it wasn’t all that dry either. Kent Black quickly became a living exemplar of the line, “I wasn’t born in Texas, but I got here as quick as I could.” The next twenty years included two short sojourns in California, but Black’s heart and home were in Texas, and he always came back. This involved working with the state coordinating board, which had final approval on curriculum changes and, more importantly, working with the local politics of the thing. Education, particularly higher education, is a very political beast, with schools and communities guarding their turf vigorously, ever wary of someone or some institution seeking to intrude on their domain. “UT-Arlington didn’t really want UTDallas competing with them. I made a lot of trips to Fort Worth for meetings with the chairman of Tandy [the Fort Worth based hobby and computer company, owner of Radio Shack] trying work out compromises on what we would do at UTD.” As a result of the work of Black and others, UTD got its engineering school in 1985, and “It has been incredibly successful,” Black added. Black’s career was incredibly successful too. As he did “a pretty good job” with each assignment delegated to him, he moved upward from one position to another. During his thirty-four years with Rockwell, he was the executive vice president and chief operating officer of Space Systems, Rocketdyne, Collins Commercial Avionics, Defense Systems, and Graphic Systems businesses. He was also chairman of Rockwell’s Systems Development Center Board and a member of the company’s Corporate Strategy Committee. 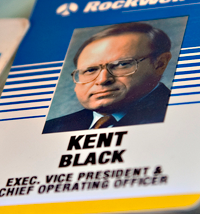 The company didn’t have a “president” in those days, so when Black moved up to the top spot, his title was Chairman of the Board, Executive Vice President and CEO. A momento from Black's years at the U.S. Space Alliance. On retirement from Rockwell in 1996, he accepted the job as top man at United Space Alliance, a joint venture between Rockwell and Lockheed developed to pull all the responsibility for the Space Shuttle under one management team. It was not a job he had sought. It sought him. Black served in that capacity for almost two years before retiring again, spurred by what seems a widely shared desire of grandparents to spend more time with grandchildren, and, “I finally got sick of all the travel.” After a number of years commuting between Lake Texoma and California for Rockwell, Black and his wife put in another stint on the road, or rather in the air, between North Texas and a condo in Houston, where United Space Alliance had its headquarters. Black has had a presence on Lake Texoma since 1982. “I bought a houseboat, but after a few years, Karen got tired of bouncing around in the boat at night, so I agreed to build a log cabin in Tanglewood in ’86. In 1992, the Blacks acquired the property that became the K-Bar-K ranch and built the house they now live in. But there is more to his relationship with the Blacks than business. “He’s become like a son,” said Kent Black, “and his two daughters are our granddaughters.” The Galyons live on the ranch, as does the Black’s oldest daughter Elizabeth. Daughter Nancy lives in Anna, and has two daughters of her own. The K Bar K, spread over 1,400 acres, is a “cow-calf” operation, with a base breeding herd of mother cows and bulls. Each year’s calves are sold between the ages of six and twelve months, along with culled cows and bulls, except for some heifers retained for breeding herd replacements. The pride of the spread is Gentleman Jim, a 2,500 pound bull about the size of a Volkswagen. “I’m busier now than I was when I was working,” said Black, and some of the reasons are the duties he takes on for various groups in the county. “The biggest thing right now is the construction of the Reba’s Ranch House,” he said. “I’m the board member responsible for overseeing the construction. “Steve Cook, a realtor here in town, and I became friends years ago, and in 2006, he asked me to joined the TMC Foundation board. Because it had been a public hospital, when it was sold, the net proceeds of the sale had to stay public, so they were transferred to the new foundation, which was renamed the Texoma Health Foundation. RMAs had been created by constitutional amendment in 2001. Their status as independent governmental entities gave them authority over all manner of transportation-related operations. And more importantly, they could raise money in much the same way more traditional public organizations such as county governments could. The Grayson Regional Mobility Authority is one of only six in the state. To the community projects they embrace, Kent Black and other former business leaders like him, bring the well developed habit of getting things done. They are all builders in one form or another. Their organizational skills are important as is their ability to understand how the many small segments of a project come together to produce the whole. Even more important are their motivational talents, the ability to share their vision and to help others see the value in the goal and work for it as well. Kent Black, who once reached for the stars, now brings that vision to improvements that directly affect the lives of his neighbors—a better health care system, improvements in education, enhanced ways of getting from here to there, and something as basic as a new fire truck or ambulance for his rural community. Kent and Karen Black at home in 2010. “I know it sounds a little corny,” he said, “but I’m a great believer in America and the way we do things here. The freedoms we have, the opportunities we have. I come from a small family farm, and look at all the opportunities I’ve had. You can’t do that everywhere in the world. “I really believe in the freedoms that are built into our system, starting with the constitution. I believe in the capitalistic, free enterprise system we have. There’s no question in my mind that we have the best free enterprise system in the world, which is one of the reasons we lead in so many ways. 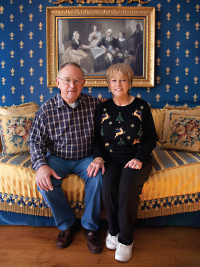 Editor’s Note: Texoma is fortunate in having a wealth of people who have accomplished much before retiring and moving here to live. For people like that, finishing one career is often only the prelude to starting another. They bring the habit of achievement to everything they undertake, and more often than not their skill, talent, and drive are turned to giving back to the community they now call home. Thank you, Mr. Black. For providing a young man the opportunity to work with and support Rockwell’s finest executives. Would you believe I am still in the video conferencing industry and loving every minute if it. In large part thanks to you. Good to see you. Are still kickin Freda and I are in Florida but suspend most of our time in our motorhome maybe we will. Stop by the next time ewe are going through Texas. All the best.